The Donetsk team are preparing at the training base in Sviatoshyno. On Friday morning, the team held the last training session before the away game. In the previous round, the Orange-and-Blacks defeated Mariupol 3-1 (the goals were scored by Bernard, Marlos and Serhii Kryvtsov). Paulo Fonseca’s men are sitting in the second spot with 9 points. Oleksandriia coach Volodymyr Sharan called Shakhtar an excellent examiner before the two-legged tie vs BATE. We want to remind you that on August 17, Borysiv will host the Citizens’ first game in the Europa League qualifying stage play-offs vs the champions of Belarus. 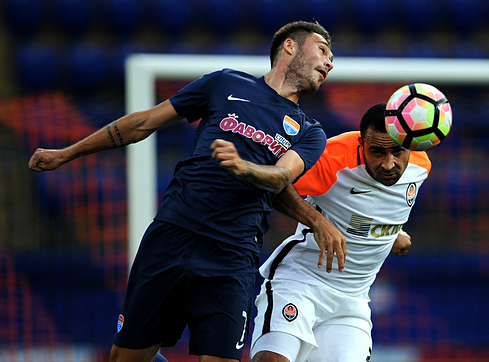 In the new Premier League season, Shakhtar’s opponents have not yet won: the opening round defeat at Olimpik was followed by draws vs Veres, Zorya and Chornomorets. Oleksandriia are sitting with three points in the ninth spot in the table. Due to suspension, midfielder Artem Chornyi will miss Saturday’s game. All in all, the opponents had 12 meetings. Shakhtar won on 11 occasions, with another game ending in a draw. The goal difference is 26-8, on the pitch of Alexandria: 12-7. The Orange-and-Blacks finished the past season in Oleksandriia. Oleh Kudryk, Giorgi Arabidze and Andrii Boriachuk got a chance to appear in the opening minutes that night. It was the latter two who caused a goal in the 19th minute: the striker flicked the Georgian’s pass into the back of the net. However, the opponents quickly responded with a precision long-range strike by Serhii Starenkyi. In the second half, debutants Ihor Kiryukhantsev and Oleksandr Pikhalyonok appeared on the pitch, with the scoreline remaining unchanged until the final whistle – 1-1. In the four recent games in Oleksandriia, both teams have scored goals. After appearing in the next match, Andriy Pyatov will be among the Donetsk team’s top 5 players in terms of the number of meetings. Be the first to know the Miners’ line-up by signing up to the Telegram and Viber accounts of FC Shakhtar.